This entry was posted in Organization Structure and tagged competition, cooperation, manager, silos on August 18, 2015 by Tom Foster. How Does Hierarchy Promote Cooperation? I recently attended one of your Time Span workshops and want to know how hierarchy promotes cooperation? The short answer is accountability. Inherent in the structure of hierarchy is accountability. Unfortunately, most managers misunderstand the purpose for hierarchy and where accountability is appropriately placed. 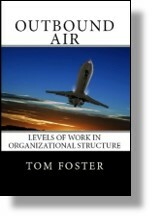 Most managers believe that hierarchy is a reporting structure. Even our language misguides us. “Who is the new guy going to report to?” This is not the central question. When managers begin to understand accountability, the whole game changes. Hierarchy provides us with a visual representation, of which manager is accountable for the output of the team. When managers begin to understand that they are accountable for the output of their team, attitudes change and behavior changes. Behaviors change from controlling and directing to supporting and coaching. Every employee is entitled to have a competent manager with the time span capability to bring value to their problem solving and decision making. The purpose of hierarchy is to create that value stream, where managers, one stratum above (in capability) bring value to the problem solving and decision making of their team members. For ultimately, it is the manager who is accountable for their output. This entry was posted in Accountability, Coaching Skills and tagged accountability, coaching, cooperation, decision making, problem solving, value stream on December 4, 2013 by Tom Foster.